Today's guest post is from filmmaker / hybrid DIY distro guru, Jon Reiss. Over the last several months an argument has arisen within the independent film community as to how much (and whether) filmmakers should focus on the distribution and marketing of their films. I am rather surprised that there is an argument. I am very surprised that lines have been drawn in the sand, armies joined and deployed. I feel that the discussion to date misses two very important points. First – there is no one kind of independent filmmaker. There is no one kind of filmmaker. Never has, never will be. Thank god. Each person who is involved in independent film has his or her own desires, interests, passions, loves, hates. Each filmmaker has different motivations for making a film. Some want to make a statement, change the world – whether it is social or artistic. Some want to make money. Some want to express an idea or emotion to as many people as possible. Most filmmakers want it all. However if push comes to shove, filmmakers will prioritize what they want from their films. And these desires are different for different filmmakers. Similarly not everyone in independent film wants to be a director, or a writer-director, or a writer-producer-director. Some filmmakers just want to direct and prefer to collaborate with scriptwriters and producers. Some filmmakers don’t want to direct, but want to be producers, DPs, editors etc. Second, the debate implies that directors or multi hyphenate writer-director-producers should be primarily responsible for these new tasks. I will always be among those that directors should not be solely charged with the distribution and marketing of their films. As a filmmaker, I know how incredibly difficult this is (especially while making a film) – Frankly one of the reasons this blog post is perhaps a bit late to the debate is that I have been involved with shooting Bomb It 2. However, I do believe that distribution and marketing should be woven into the filmmaking process just as preproduction planning, casting, scriptwriting, editing, sound mixing are all a part of the filmmaking process. Just as you don’t consider the sound for your film when you are about to mix or even when you are editing dialogue. If good sound is important to you as a filmmaker, usually you are considering the sound for your film no later than the tech scout, and often from the script stage. Similarly I feel that filmmakers will be helped both logistically and creatively to incorporate distribution and marketing into the entire process of making their films. It should be understood by our community that distribution and marketing are not about tailoring your film to an audience that you feel you can capitalize on (however if the sole goal for your film is to make money – perhaps this might be a path for you). A better way to view this process is that distribution and marketing are about finding the audience that already exists for your film, your vision. (I credit Marc Rosenbush with this keen perspective). This process of audience engagement takes either a lot of money or a lot of time. Most independents do not have much of the former, and so must rely on the latter. It also takes knowledge. Knowledge can either be learned through experience or through education or a combination. 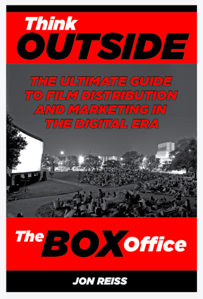 A year ago, I felt compelled to write a book about distribution and marketing for my fellow filmmakers as a guidebook to this process. I did this so that they could learn from my experience and the experiences of others and so that they wouldn’t have to reinvent the wheel each time anew. (How awful would it be that every time we shot a film we had to relearn how different lenses, different lighting, different editing affected the emotional quality of a scene). It is time to compile our knowledge and share it with each other so that each new filmmaker does not have to waste his or her time to relearn tools and techniques that have been tried by others before them. I have begun a number of other educational initiatives to which I will devote most of the next twelve months. I do this not to load more work onto the backs of my fellow filmmakers. The work frankly exists even if you are one of the lucky few to have a distributor swoop down with a check to relieve you of this burden. 1. To provide a systematic way to train a new cadre of crew people to be responsible for the distribution and marketing tasks on a film. I call these new crew people Producers of Marketing and Distribution. I gave this crew position a name because only with a proper name will the work be recognized, rewarded and most importantly trained for. Few directors want to do every job on their films. Many don’t want to be multi-hyphenates. They are happy to find a brilliant script to bring to the screen. They are happy to work with a brilliant DP or Production Designer. They are happy to collaborate with a creative producer who will help them realize their vision. God knows I am. Just as filmmakers are eager to collaborate on what has been previously thought of as the work of film, directors and producers should be eager to collaborate with additional crew people who will carry out the numerous tasks of distribution and marketing. I hope by the time I make my next project, I can put out a call for a Producer of Marketing and Distribution on Shooting People, or Mandy and I will receive a flood of emails. I hope this for all filmmakers. In order to create these new crew people, we must provide a way to educate them. Toward this end, I am now working with film organizations around the world to create a variety of educational opportunities to teach this material in the form of classes, labs and workshops. I am also in the process of creating an online tools website so that filmmakers can share information about distributors, screening networks and the like (kind of a marketing and distribution yelp for filmmakers). This website will eventually grow into an online academy to teach these tools to filmmakers (especially to create a cadre of PMDs for filmmakers). 2. Filmmakers who have no intention of shooting their films still take classes in (or read books about) cinematography so as to understand the art. Similarly, I feel that filmmakers should at least have a sense of what is entailed in distribution and marketing a film so that they can understand that process. This does not mean that they have to devote their life to this education (or to the work). But with knowledge comes power. I advise my film directing students at Cal Arts to learn the basics of budgeting and scheduling, even if they never intend to produce, AD, UPM or line produce. I believe by learning the process, they will however acquire the tools to look at a budget and schedule and understand where resources are being allocated so that they can have an informed discussion with their line producer about said resource allocation. 3. As independent filmmakers, we need to be prepared to take on any task in the filmmaking process, because we are never sure if we will have someone else to do that task for us. You might not be lucky enough to have someone shoot your film, edit your film, help you with the distribution of the film. Hence any of these roles might fall to you. I can’t afford to take a DP with me around the world to film Bomb It 2 (or a producer or sound person) – so I am doing it myself. Independent filmmakers have always been Jacks and Jills of all trades. Distribution and marketing is one of the trades we thought we could hand over to others. We know now that this (fortunately or unfortunately) is not always the case. As I learned from my odd 7th grade math teacher: Proper Prior Planning Prevents Perplexing Problems. 4. Maybe, just maybe, in learning about distribution and marketing you might discover some new creative way to express your vision that you did not previously know existed. I love feature films. I love great shorts. I even love great television of either conventional length. But these are four forms that have become ossified in the filmmaking world for too long as the only forms. I feel that great creativity will come from expanding filmmaking – nay media creating – forms. Why slaughter your babies in the editing room? Find new life for them. Why not create multiple babies in the script stage to express your thoughts in a myriad of new directions? And still make a feature film if that is your passion. Why not collaborate with other filmmakers to help you create these new forms of content and reach those audiences, if your goal is to focus solely on making the feature? 5. Maybe, if you are interested, you might create a long-term relationship with a core audience, that might help to sustain you as an artist. The central point is this: Don’t limit yourself. Open up your arms to the vast amount of creative potential that awaits you, and do so with the collaboration of others who are eager to help you. I believe this should be the model for us as a community to face the new financial realities of our world. There is too much work to be done for those in our community to vilify others. It is a time ripe for great opportunity to create and engage with audiences as we have been doing as a species since we first sat around fires telling stories. The form will change, the meaning to us, as human beings will not. I am doing a workshop in conjunction with IFP on June 5th and 6th. Instead of panels, we are having a cocktail party for participants to meet with distributors and other distribution and marketing service providers. I will be doing another workshop in Vancouver on June 12 – 13th. Finally for June I have collaborated with the LA Film Festival and Film Independent to create a three-day distribution and marketing symposium. A day and a half boot camp for the competition filmmakers, and a day and a half open to the public focused on 1. Tools instruction 2. Exploring the potential available to us all.